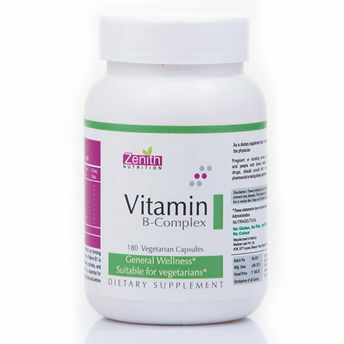 Zenith Nutrition Vitamin B-Complex contains vitamin B1 (known as thiamine), vitamin B2 (riboflavin), vitamin B3 (niacin), vitamin B5 (pantothenic acid), vitamin B6 (pyridoxine), and vitamin B12 (the cobalamins), as well as biotin and folic acid. These nutrients are vital for stress relief and nerve function. Explore the entire range of Multivitamins available on Nykaa. Shop more Zenith Nutrition products here.You can browse through the complete world of Zenith Nutrition Multivitamins .Alternatively, you can also find many more products from the Zenith Nutrition Vitamin B-Complex Capsules range.